Agriculture uses about 80 percent of California’s developed water supply. As such a large user, it is heavily impacted by the availability and reliability of California’s water resources. Agriculture can also play an important role in helping the state achieve a more sustainable water future. The challenge is to transition to an agricultural sector that supplies food and fiber to California and the world and supports rural livelihoods and long-term sustainable water use. The agricultural water use efficiency strategy describes the use and application of scientific processes to control agricultural water delivery and use to achieve a beneficial outcome. It includes an estimation of net water savings or increased production resulting from implementing efficiency measures as expressed by the ratio of output to input, resulting benefits, and strategies to achieve efficiency and benefits. California ranks as the leading agricultural state in the United States in terms of farm-level sales. In 2012, California’s farm-level sales totaled nearly $45 billion and accounted for 11% of total U.S. agricultural sales. Five counties—Tulare, Kern, Fresno, Monterey, and Merced—rank among the leading agricultural counties in the nation. 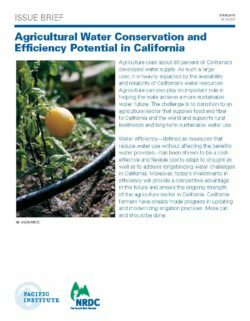 Given current drought conditions in California, however, there has been much attention on the use of water to grow agricultural crops in the state. Depending on the data source, irrigated agriculture accounts for roughly 40% to 80% of total water supplies. Such discrepancies are largely based on different survey methods and assumptions, including the baseline amount of water estimated for use (e.g., what constitutes “available” supplies). Two primary data sources are the U.S. Geological Survey (USGS) and the California Department of Water Resources (DWR). 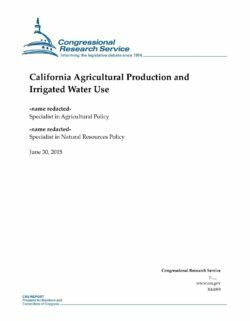 USGS estimates water use for agricultural irrigation in California at 25.8 million acre-feet (MAF), accounting for 61% of USGS’s estimates of total withdrawals. DWR estimates water use withdrawals for agricultural irrigation at 33 MAF, or about 41% of total use. Both of these estimates are based on available data for 2010. 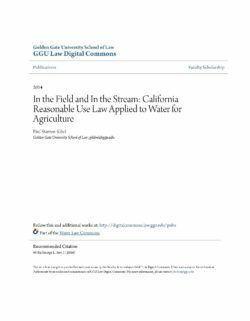 These estimates differ from other widely cited estimates indicating that agricultural use accounts for 80% of California’s available water supplies, as reported in media and news reports. Attention has also focused on trends in California toward growing more permanent orchard crops, such as fruit and nut trees and vineyard crops, as well as production of grain and pasture crops, much of which is used to support the state’s meat and dairy industries. Orchard crops refer to tree or vineyard crops that are planted once, require continuous watering to reach maturation, and cannot be fallowed during dry years without loss of investment. In contrast, most vegetables and other row crops (including grain and pasture crops) are annual crops that are sown and harvested during the same production year, sometimes more than once, and may be fallowed in dry years. Between 2004 and 2013, overall harvested acres in California increased for almonds, walnuts, pistachios, raisins, grapes, berries, cherries, pomegranates, and olives, but also for corn. During the same period, overall harvested acreage decreased for some field crops (cotton, alfalfa, rice, wheat), but also for certain orchard crops (wine grapes and some citrus and tree fruits). This shift to growing more permanent crops, especially tree nuts, appears to be largely market-driven. The availability of irrigation water has been a major factor in the development of California’s agricultural production. California has the largest number of irrigated farmed acres compared to other states and accounts for about one-fourth of total applied acre-feet of irrigated water in the United States. Water use per acre in California is also high compared to other states. Available data for 2013 indicate that, of total irrigated acres harvested in California, about 31% of irrigated acres were land in orchards and 18% were land in vegetables. Another 46% of irrigated acres harvested were land in alfalfa, hay, pastureland, rice, corn, and cotton. Congressional interest in California agriculture and water use centers largely on the Bureau of Reclamation’s Central Valley Project (CVP), which supplies water to numerous agricultural and municipal contractors. In recent years, the CVP has cut back water deliveries due to drought and environmental factors. Congress also authorizes and oversees U.S. Department of Agriculture support for individual crops and farmers, and some Members have expressed concern over the broader implications of decreased agricultural production and/or lack of water availability throughout the state. This is a key time for California water: the California Water Bond has been tabled for at least two years and may be scrapped altogether. New reviews from around the state are calling for prompt efforts to use technology, economics, and institutional reform to address the state’s water crisis. All parties seem to agree that the state will need a diverse portfolio of solutions – but it makes the most sense to do the most effective things first. 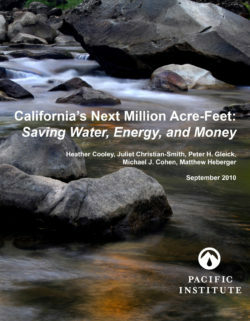 The Pacific Institute’s new report, California’s Next Million Acre-Feet: Saving Water, Energy, and Money, quantifies more than one million acre-feet of water that can be conserved through improved efficiency, with savings coming from the urban and industrial sectors and improvements in agriculture. The efficiency improvements identified in California’s Next Million Acre-Feet require an upfront investment of less than $1.9 billion, costs that could be borne by a mix of state, federal, and local agencies and individuals – all at a small fraction of the cost of the proposed water bond. The cost of the conserved water is $185 per acre-foot for the agricultural sector and a net savings of $99 per acre-foot for the urban sector, over the lifetime of the efficiency improvement. Conserving water also conserves energy, saves money, and reduces the need for new water and energy projects. The FAO-56 dual crop coefficient model was used to simulate site-specific irrigation management to quantify the green water resource (rainfall stored in soil) in five California perennial crops (alfalfa, almonds, grapes, pistachios, and walnuts), considering local soil water holding capacity and climate data from 2003 to 2018. We tested different rooting depths and irrigation management thresholds (allowable depletion) across 1.46 million hectares of cropland to determine how the size of the soil water reservoir affects green water utilization and, consequently, blue water demand (irrigation). The 13-year cumulative green water utilization ranged from 17 to 36 million km3 out of a 57 km3 rainfall input and 162–263 km3cumulative blue water demand. For a deep scenario (2 m rooting; 50% allowable depletion), green water met 12% of cumulative crop water demand. However, green water use was not uniform: 20% of the landscape met over 20% of its annual crop water demand. Deeper rooting or greater allowable depletion reduced blue water demand more than the increase in green water utilization, due to less frequent irrigations, which reduced soil evaporative loss. Compared to a 'business-as-usual' shallow irrigation management scenario (0.5 m rooting; 30% allowable depletion), a moderate scenario (1.0 m rooting; 50% allowable depletion) saved 30 km3 blue water evaporation and increased green water use by 7 km3through 13 years. Such savings would fill California's largest reservoir, Shasta Lake, 6.6 times. 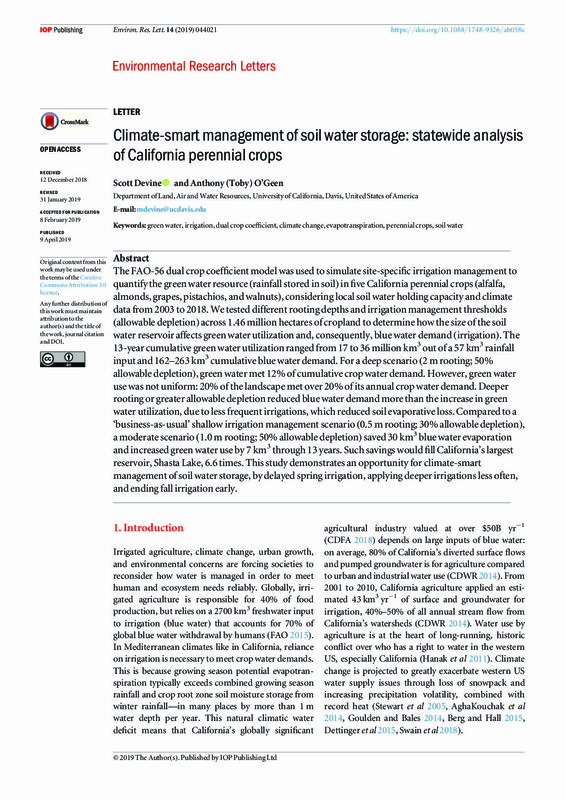 This study demonstrates an opportunity for climate-smart management of soil water storage, by delayed spring irrigation, applying deeper irrigations less often, and ending fall irrigation early. The document titled “A Guidebook to Assist Agricultural Water Suppliers to Prepare a 2015 Agricultural Water Management Plan” (Guidebook) was prepared by the California Department of Water Resources (DWR) to assist agricultural water suppliers in understanding and complying with the requirements of the SB X7-7- Water Conservation Act (Steinberg Statute of 2009), (Section I, Part 2.55, Division 6 of the California Water Code), the associated Agricultural Water Management Planning Act (Section I, Part 2.8, Division 6 of the Water Code), the Agricultural Water Measurement Regulation (Title 23 California Code of Regulations), and Executive Order B-29-15. 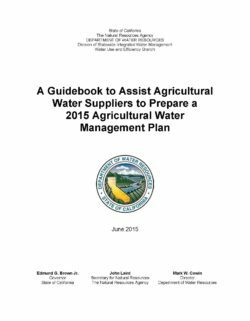 It is meant to help agricultural water suppliers better understand the Water Code Agricultural Water Management Plan (AWMP) requirements and assist them in developing an AWMP. This Guidebook also describes how water conservation plans submitted to the U.S. Bureau of Reclamation (USBR) can be supplemented to satisfy the Water Code and Agricultural Water Measurement Regulation requirements. California’s agriculture sector has exceeded expectations during the most severe drought in recorded history at the cost of massive but unsustainable groundwater pumping. Continued groundwater overdraft, while reducing the economic impacts of the drought for the agricultural sector now, has shifted the burden to others, including current and future generations forced to dig deeper wells, find alternative drinking water sources, and repair infrastructure damaged by subsidence. That is the conclusion of the new study, Impacts of California’s Ongoing Drought: Agriculture, released today by the Pacific Institute, an independent global water think tank. 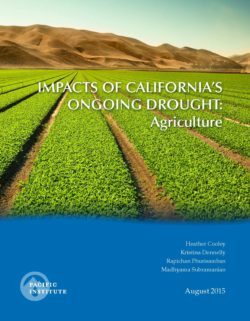 This new study is the first comprehensive analysis of the actual impacts of the drought on California agricultural revenue and employment through 2014 – the last year for which data are available. The study, drawing on data from the USDA National Agricultural Statistics Survey and the California Employment Development Department, analyzes acreage, revenue, and employment figures from 2000-2014. Production costs, impacts on animal or nursery products, or regional impacts are not examined because these data are not yet available. The study’s results provide critical insight into how the state can maintain a healthy agriculture sector in a future likely to see less water, more extreme weather, and greater uncertainty. California remains the largest agricultural producer in the U.S. in total output and in exports. During the drought, California’s agriculture sector has experienced record-high crop revenue and employment. Last year farmers harvested 640,000 fewer acres, which was 9 percent below pre-drought levels, yet crop revenue remained strong. Indeed, crop revenue peaked in 2013 at $34 billion – the highest level in California history. In 2014, crop revenue declined by $480 million, representing a 1.4 percent reduction from 2013 levels. All economic estimates have been corrected for inflation. Statewide agriculture-related jobs also reached a record-high of 417,000 people in 2014, highlighting the sector’s ability to withstand the reduction of available water. 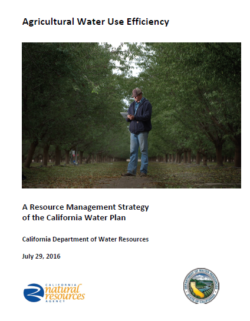 Twenty-four of California’s agricultural water districts have submitted agricultural water management plans, leaving 55 districts out of compliance with the requirement of the Water Conservation Act of 2009, according to a new joint analysis issued today by the Natural Resources Defense Council and the Pacific Institute. This represents a 30% compliance rate, meaning there is much work to be done to ensure sustainable water management for the state. 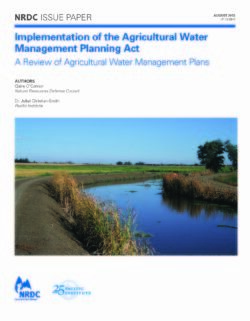 Implementation of the Agricultural Water Management Planning Act: A Review of Agricultural Water Management Plans offers recommendations for those 55 water districts to participate in and comply with future legally required planning cycles, including: 1) California’s Department of Water Resources (DWR) should offer peer-to-peer workshops to assist districts with the planning process; 2) DWR should create an online clearinghouse of plans and draft plans to facilitate public comment; and 3) DWR should hold non-compliant districts accountable, and, per the Act’s mandate, refuse to consider grant and loan requests until districts submit a plan. surface fresh water instream. The demands for additional instream flow relate in part to the declining condition of California’s native fisheries (such as salmon, steelhead and smelt). The demands for additional instream flow also relate to water quality and salinity concerns. With reduced fresh water flows in our coastal rivers, seawater is pushing further upriver, and increasingly saline water cannot be used for drinking or irrigating.6 With seawater intrusion, excessive upstream diversion of fresh water threatens the very supply of fresh water. The long-standing debate over water exports from the Sacramento-San Joaquin Delta, and the impact of such Delta exports on salinity, water quality and native fisheries, is perhaps the most prominent illustration of such demands for additional instream flow. Global competition, suburban encroachment, tighter regulations, and rising input costs are making farming in California more difficult and, in some cases, less profitable. At the same time, pesticide pollution from farming is causing significant harm to California’s surface and groundwater, air quality, and human health. 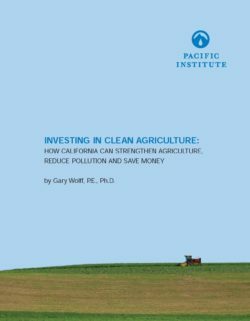 But there is a way to reduce pesticide use, protect the environment, and help farmers stay competitive according to a new report, Investing In Clean Agriculture: How California Can Strengthen Agriculture, Reduce Pollution And Save Money, published today by the Pacific Institute. A US Geological Survey study of groundwater wells in the San Joaquin-Tulare Basin found at least one pesticide in 59 of 100 samples. But current efforts to reduce pesticide pollution are caught up in the courts. The rebate approach creates a voluntary incentive to reduce pesticide use while leaving it up to farmers to figure out the best way forward. The report describes how farmers can be rewarded for learning voluntarily about sustainable agricultural practices. A modest increase in the statewide “mill” fee, now levied on pesticides, is returned to farmers who take a short course on sustainable agriculture techniques and storm runoff management. This helps farmers stay competitive while reducing pesticide use – which will protect human health, preserve the environment, and eventually save taxpayers money by reducing medical costs. Investing In Clean Agriculture: How California Can Strengthen Agriculture, Reduce Pollution And Save Money estimates that the voluntary program and fee increase could bring $60 million per year into the agricultural sector while also bringing the most cutting edge research on sustainable farming techniques to those in the field.